This is my latest and very unusual creation that came from my desire to experiment. Yah, right! Actually, I had no idea what to cook for dinner so I raided the freezer and pulled out bag of grilled eggplants, grilled red peppers in olive oil and container with grilled red pepper and sundried tomato sauce. In refrigerator, I had shallots, garlic, ham and wonton wrappers and I came up with sort of Chinese – Italian fusion recipe. I chopped the eggplants and peppers while they were still frozen, than I chopped the shallots, garlic and ham and sautéed them until soft. I added eggplants, peppers and 1/2 cup of white wine and I cooked it untill there was no liquid left, let it cool before mixing in quite a bit of grated Parmigiano Regiano cheese. Of course the mix was seasoned with salt and pepper along the way. 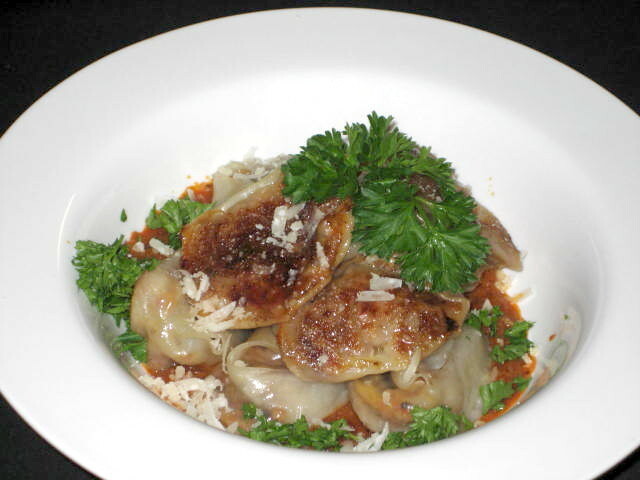 The dumplings had a shape like ravioli but I cooked them like potstickers. Served on top of sundried tomatoes and pimento sauce, they were so delicious! I have especially liked the mix of textures in wonton wrappers that run from soft to chewy to crispy crunch, just perfect. Next time, and it will be soon, I will serve the sauce on side, just like Chinese potstickers, because the crispy bottom of ravioli that touched the sauce got soft. They were still great but soft.